Al Farrow designed and constructed the bell that will be used in the ZC50 event Resounding Compassion: A Concert for Peace. The concert is on June 4 at the SF Conservatory of Music. 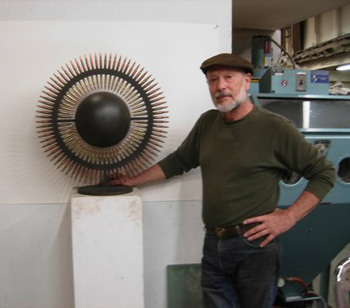 I spoke with Al Farrow in his workshop/studio in an industrial area in San Rafael. 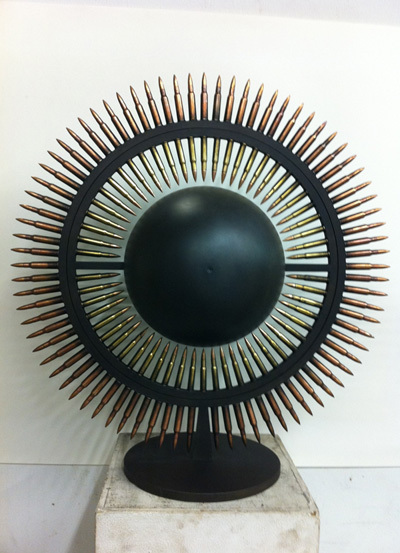 I was curious about the bell he had designed and crafted using bullets for Resounding Compassion: A Concert for Peace, one of the Zen Center 50th Anniversary events, and wondered what led him to use weapons in this and other sculptures. Farrow described his work and its meaning. Farrow also sculpts mosques, synagogues, and religious objects such as menorahs (branched candle holders lit at the Jewish holiday Chanukah) that incorporate guns and bullets. One menorah is made from a machine gun used by Nazis and French pistols used by the Vichy regime that supported Hitler. We walked through his workshop to see two synagogues he is currently completing for a show this summer in Belgium. �I have been doing social commentary art all my life. I began the series of religious objects and buildings 17 years ago after a trip to Europe in which I saw Catholic reliquaries. I thought about all the violence done in the name of religion. This happens in all religions, even Buddhism.� Farrow intends to sculpt Hindu and Buddhist temples and is researching them now. Born in Brooklyn in a Jewish family, Farrow rejected Judaism after his Bar Mitzvah. He appreciates religious tenets but not religious organizations. After his children were born, Farrow investigated various religions and decided not to give his children any religious education – �Most important was to raise them with respect,� he said. Farrow showed me his early sculptures of Africans carrying bullets, his way of expressing concern about international arms sales and arming young soldiers. He also sculpted bodies fused to flying machines. In one a figure is attached to an airplane modeled after the Enola Gay that dropped the atomic bomb on Hiroshima.